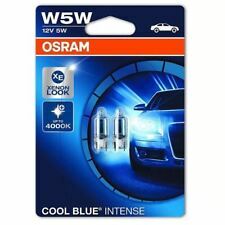 OSRAM W5W Cool Blue Intense. Bluish white light for xenon look. High luminous flux. Bluish-white light for stylish xenon look. Stylish look. Position and parking light. Number plate light. Color temperature: up to 4,000 K.
Lamp emits amber light. Amber when ON. No irritating color effects. Homogenous appearance. 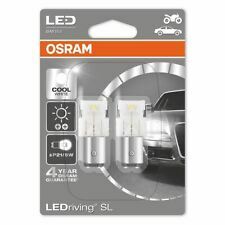 OSRAM C5W LEDriving Standard Cool White. Compatible with conventional festoon lamp base. Matches 31 mm, 36 mm & 41 mm festoon types. Not ECE conform. Available in Cool White and Ice Blue. Interior lighting. OSRAM PY21W LEDriving Premium Amber. Compatible with conventional PY21W lamp base. Available in Amber. Modern and intense light. Worldwide Service 12 Months Warranty. Why buy from us?. Product authentication. 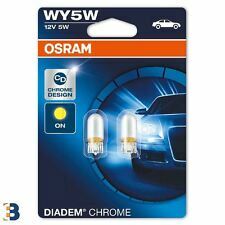 OSRAM W5W LEDriving Premium Warm White. Available in Warm White, Cool White, Amber and Ice Blue for a variety of customization options. Interior lighting. Wide range of different light colors. Wide range of different light colors for a variety of customization options. OSRAM C5W LEDriving Premium Cool White. Compatible with conventional festoon lamp base. Matches 31 mm, 36 mm & 41 mm festoon types. Not ECE conform. Available with light color: Warm White, Cool White. REFERENCE 66140. HIGH quality OSRAM. INTEGRATED STARTER. 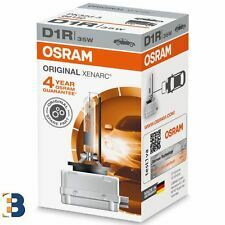 OSRAM W5W LEDriving Standard Amber. Interior lighting. Wide range of different light colors for a variety of customization options. Available in Cool White, Amber, Red and Ice Blue. Different light colors for various applications. With LED technology and a color temperature of 6,000 K, the OSRAM LEDriving HL represents the most convenient solution in order to upgrade your existing headlights – providing a stylish cool white look as well as improved visibility for everything that lies ahead of you. Ideal for all indicator lights with clear covers. Indicator light. Lamp emits amber light. No irritating color effects. Worldwide Service 12 Months Warranty. Amber when ON. 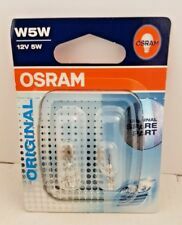 OSRAM W5W ORIGINAL DUO. 12V 5W 2825-02B 501. 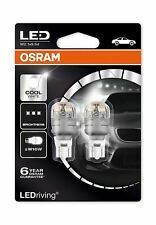 OSRAM C5W LEDriving Premium Cool White. Compatible with conventional festoon lamp base. Matches 31 mm, 36 mm & 41 mm festoon types. Interior lighting. Available with light color: Warm White, Cool White. OSRAM C5W LEDriving Premium Cool White. Matches 31 mm, 36 mm & 41 mm festoon types. Compatible with conventional festoon lamp base. Available in Warm White and Cool White for a variety of customization options. 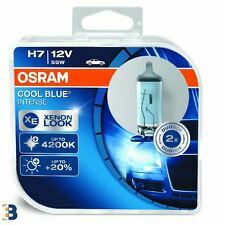 OSRAM H7 Cool Blue Intense Halogen. The modern design with silver cap (H4/H7/H11/HB4) is ideal for use in clear-glass headlights. That gives your car a stylish look. With its powerful and bright bluish-white light up to 4200 Kelvin, whose cool beam makes it look very like a xenon lamp, it gives real design fans their money's worth. EXCELLENT LIGHT OUTPUT, VERY LOW CONSUMPTION, VERY LONG LIFE. 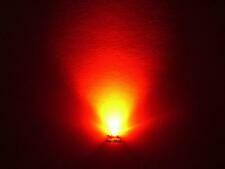 OSRAM C5W LEDriving Premium Warm White. Compatible with conventional festoon lamp base. Matches 31 mm, 36 mm & 41 mm festoon types. Not ECE conform. Available with light color: Warm White, Cool White. Not ECE conform. Product features. Worldwide Service 12 Months Warranty. 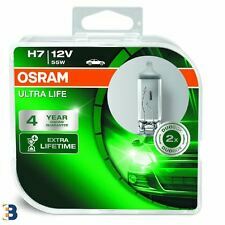 12V 2W QUALITY OSRAM PRODUCT. OSRAM T4W LEDriving Premium Cool White. LED T4W available with color temperature: 4000 K, 6000 K. LED T4W available with light color: Warm White, Cool White. Not ECE conform. Available in Warm White and Cool White for a variety of customization options. OSRAM LEDambient® INTERIOR STRIP KIT. This new LED strip kit is perfect for lighting the interior of any car, van or truck and can be used in the foot well, boot, glove box or roof. It has many flexible uses for many application areas. OSRAM W21W LEDriving Premium Amber. Compatible with conventional W21W lamp base. Available in Cool White, Amber and Red for a variety of customization options. Available with light color: Cool White, Amber, Red (for usage behind red glass). OSRAM C5W LEDriving Standard Blue. Compatible with conventional festoon lamp base. Matches 31 mm, 36 mm & 41 mm festoon types. Interior lighting. Available with light color: Cool White, Sky White. Two different light colors for a variety of customization options. 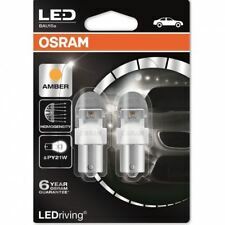 OSRAM W5W LEDriving Amber. Available in Warm White and Cool White for a variety of customization options. Available with light color: Cool White, Warm White. Not ECE conform. Modern and intense light with color temperature 4000K or 6000K. If your car isn't looking quite as modern in the new traffic, then the Cool Blue Boost is for you. 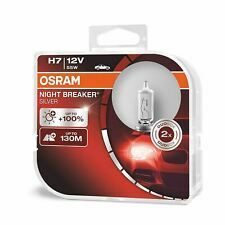 OSRAM H7 Cool Blue Boost. With the Cool Blue Boost, OSRAM has made a whiter and brighter bulb. Bluish-white light for stylish xenon look. OSRAM LEDriving FOG 101 MOUNT. For Toyota, Lexus and Daihatsu. Fits all models with 90mm fog lights with no modifications. Product image INFORMATION TO THE PRODUCT Adjustable for light shielding. OSRAM ORIGINAL SPARE PART QUALITY. 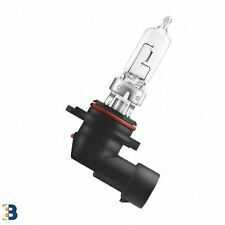 Installation of this item bypasses the lamp failure function of the can bus system on your vehicle. Help & FAQs. Many existing vehicles are designed for use with halogen based products and installing LEDs can often trigger a warning light on the dashboard of your car. We will always attempt to rectify the issue as fast as possible! Eg, Vetech, Erst Klassig, Franzen, NK, etc. With this in mind, we will indicate what type of product you are looking at within the following guidelines. 2 X 581C OSRAM BULBS. OSRAM LEDriving LED Retrofit C5W for internal lighting 6498CW-01B Cool White 6000K 80% less energy consumption - Single blister. Resistant to shock and vibration OSRAM LED Premium Retrofits - 12 V Festoon - the modern way to illuminate interiors. 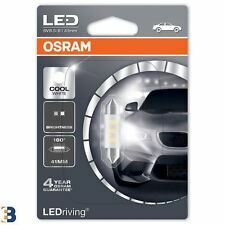 OSRAM T4W LEDriving Premium Cool White. LED T4W available with color temperature: 4000 K, 6000 K. LED T4W available with light color: Warm White, Cool White. Available in Warm White and Cool White for a variety of customization options. MPN 2880CW 1W. 2 bulbs of Led Osram W5W T10 1W White W 2.1 x 9.5 d. -White 6000k. -Valid for position, interior, ceiling, doors. (a) transfer. 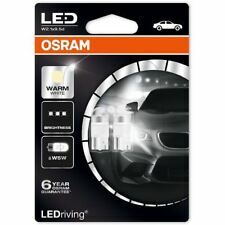 OSRAM C5W LEDriving Premium Warm White. Matches 31 mm, 36 mm & 41 mm festoon types. Compatible with conventional festoon lamp base. Available in Warm White and Cool White for a variety of customization options. 10 x OSRAM W5W bulbs. Blinking light, brake light, fog lights, rear light. Position and parking light. Interior lighting, reading light. Socket Version:W 2,1 x 9,5 d.